As our country faced the greatest economic crisis in generations during the financial collapse of 2008, a rare bipartisan majority passed a $700 billion bailout for failing banks known as TARP, the Troubled Asset Relief Program. During the financial meltdown, Americans lost more than $10 trillion of their own hard-earned savings when housing values plunged and retirement accounts were hollowed out. Why did Congress move so quickly and on such a historic scale to save the financial sector, but not do anything remotely similar to provide direct relief to the working- and middle-class voters who were suffering an even greater loss—and who, incidentally, had the power to vote them out of office? In White-Collar Government, Nicholas Carnes, an assistant professor of public policy at Duke University, suggests that one underexamined factor shaping economic policy in the United States is the social class of the legislators who vote on it. Much serious scholarship and political analysis (often two very different things) have explored external influences on lawmakers—most notably campaign contributions—that create a systematic bias towards elite economic interests. Carnes is trying to isolate something different and harder to track. As he states, “Whether our political process listens to one voice or another depends not just on who’s doing the talking or how loud they are; it also depends on who’s doing the listening.” While studies have frequently analyzed differences in voting based on a legislator’s gender or ethnic and racial identity, rarely have they looked at class as a factor. Carnes’s central argument is that “the shortage of people from the working class in American legislatures skews the policy-making process toward outcomes that are more in line with the upper class’s economic interests.” Essentially, he is asking whether the Congress might have pursued a different economic response to the financial crisis if more members of the House and Senate had come out of working-class jobs. Would such legislators have moved to protect homeowners before banks? Might leaders in Washington be focused on grand bargains centered on the jobs crisis instead of the deficit? Might the 1990s have seen universal health care or child care passed instead of the North American Free Trade Agreement? Carnes argues that the social-class makeup of Congress affects the way our representatives set priorities and who wins and who loses in the policy-making process. This theory tracks with common sense and my own experiences in Congress. In the months before the 2010 elections, Democratic majorities had a chance to pass legislation ending the Bush tax cuts on dollars earned above $250,000 per year—or, put another way, extending all of the Bush tax cuts for the first $250,000 of income. Nearly every Democrat in 2008 had campaigned on this simple pledge as fiscally sound and fair, including President Obama. This was good politics, particularly as Fox Business Network used uncertainty about which tax cuts would be renewed to display a countdown clock to the “Largest Tax Hike Ever.” Had Democrats acted forcefully on their campaign pledge, the optics would have shifted from fear of Democrats raising taxes on the middle class to Republicans insisting on new tax breaks for the richest Americans. Democrats’ failure to unite and act left all the Bush tax breaks in place before the election. Then, during the 2010 lame-duck session, Congress passed an $858 billion tax-cut extension, leaving in place generous tax breaks for the wealthiest Americans. Why was such an opportunity to address inequality and spur economic growth via our tax code missed? While a few Democrats argued against the expiration of the Bush rates above $250,000 on the merits—namely, that the recovery was still too fragile to restore the higher rates—most of those who prevented the bill from getting a vote before the election privately argued that the income threshold was too low. In conversations, many would tell me variations of the claim that “$250,000 a year is middle class in my district.” Such claims were, of course, wildly exaggerated. Even in the richest district in the country, Virginia’s 10th, over 80 percent of residents fall below that level. Some of the misperceptions among my colleagues can be chalked up to the traditional external arguments, such as the fact that the median income at local fundraisers probably is at or above $250,000, offering a distorted view of a district’s economic well being. But the conversations among lawmakers about the high-income Bush tax rates often had a more personal quality. That’s because we were talking about the tax bracket most members of Congress were in before getting elected, and to which they imagined returning one day. With a congressional salary of $174,000 combined with spousal income, many were already in that bracket and facing the economic challenge of college tuitions for kids and paying for a mortgage back home and an apartment in Washington. They understood others had it far worse, but wanted it to be clear that not everyone making $250,000 a year was eating caviar on a yacht. A hike of a few thousand dollars a year in taxes would be felt by these families. To Carnes’s point, members of Congress returning to their districts were more likely to hear from friends and neighbors—typically lawyers, bankers, and other professionals—about the looming tax increase than the jobs crisis facing the working and middle class. Indeed, the difference between what representatives said at public events and what they emphasized in their social networks was notable. The failure to pass a tax deal before the 2010 election resulted in the compromise package that extended the Bush tax cuts. That legislation eventually amounted to $300 billion in lost revenue over the following decade—enough to pay for, say, universal pre-kindergarten and triple the stimulus’s spending on infrastructure and transportation over the next ten years. Should a tax cut on income greater than $250,000 have been a higher priority than these or other alternatives? This same gap between congressional and working-class priorities played out during the debate over the American Recovery and Reinvestment Act—the 2009 stimulus bill. Over that three-week baptism by fire, headlines focused on the size of the stimulus, but the deepest policy fights were over the nature of the economic response needed. A contingent in the Democratic-controlled House pushed vociferously for a stimulus focused on regaining America’s competitive advantage, with a major emphasis on building and making things in the United States again. This more populist bloc lost to those who argued for a short-term injection in the form of tax credits to stabilize the economy and were willing to sacrifice most of the “rebuilding” elements in the bill to reduce the price tag (partly to get Republican votes that never came). A depression was prevented—a historic feat—but the transformational opportunity was missed. Where lawmakers stood on the question of what kind of stimulus was needed tended to track with whether they believed the economy was basically in good shape before the crash, in which case we only needed a jolt, or whether they believed this was the culmination of years of declining economic security for the working and middle class. Whether one’s peers throughout the 2000s saw their economic security track with the working class or Wall Street strongly influenced how one viewed the crisis that began in 2008. In White-Collar Government, Carnes attempts to develop a methodology for moving from the anecdotal to the academically rigorous in a relatively new field of research. The challenges are significant. For his quantitative analysis, Carnes uses legislators’ occupational histories as a measure of the class composition of Congress. He worked with an original data set that details the prior careers of 783 unique senators and representatives from 1999 to 2008, as well as data compiled by others via surveys and the Roster of Congressional Officeholders, which includes occupational information for every member of Congress before 1996. To measure whether Congress’s class makeup skews the institution’s economic policy priorities, Carnes looks at three composite voting indexes, which assign scores based on voting records. In addition to examining legislative outcomes, Carnes also looks to measure the impact of class on congressional action before any votes are cast by evaluating how lawmakers advocate for their proposals and take on roles as legislative entrepreneurs. Carnes’s analysis builds the case (though doesn’t quite clinch it—more on that below) that class does play a role in our economic policy outcomes. He finds that the few policy-makers who come from blue-collar backgrounds tend to support more liberal economic policies than their colleagues, even when you control for party affiliation, their district’s median income, and a range of other factors. If the class composition of Congress were identical to that of the nation, Carnes figures that progressives would stand to win one to six more major economic policy battles in each Congress. Perhaps more significantly, Carnes finds that lawmakers from the working class devoted more effort to their economic proposals than to other priorities, and managed to recruit twice as many co-sponsors for their economic priorities than their colleagues did for their bills. Despite those efforts, the bills working-class lawmakers introduce are rarely reported out of committee, let alone enacted. Yet even though their bills “are killed off at an exceptionally high rate,” these working-class lawmakers nonetheless continue to push progressive economic policies into the center of the policy debate. This is not inconsequential: As we have seen from the rise of the Tea Party, sometimes a small minority that fights passionately for its priorities can shift the debate even without significant legislative victories. To examine the impact of class on voting records, Carnes makes two debatable choices: first, he isolates the working class, as opposed to broadening the category by including the real middle class or using a median income standard; and second, he relies significantly on a data set that’s limited to 13 members of Congress between 1999 and 2008 who met his criteria for working class. (Among the 13 are conservative Senators Chuck Grassley and Orrin Hatch and liberal Representative Luis Gutierrez.) Carnes defines working class based on the proportion of each member’s pre-congressional career spent in working-class occupations, disregarding how legislators’ upbringing or personal wealth may affect their class status. He acknowledges that one of his primary reasons for focusing on occupations is the indicator’s expediency. But while it may be easy to collect data about politicians’ former jobs, it’s a strikingly narrow way to measure social class. As Carnes himself notes, “A person’s class is reflected in how she speaks and dresses, the kind of home she lives in, the kinds of recreational activities she pursues, and a wide range of other characteristics” (though Carnes argues these qualities are “strongly associated with how people earn a living”). Indeed, while only 2 percent of Carnes’s sample had working-class jobs, he notes that 20 percent of the legislative body came from working-class families. Thus he arrives at his baker’s dozen—from a population of 783 unique senators and representatives who held office during the 106th through 110th Congresses. Focusing on factors such as the elected official’s family history, including parental occupations, income, and educational attainment, could have helped broaden the data set. Consider Carnes’s focus on California representatives and sisters Linda Sánchez and Loretta Sanchez (who does not use the accent in her name) as a case study. The two were raised under the same roof, were provided equal educational opportunities, and belong to the same race, gender, and political party. And yet despite those similarities, the sisters have ended up with somewhat different voting records. According to Carnes, Linda’s voting record on economic issues has been more liberal than her sister’s. Carnes turns to a key difference between the two sisters as an explanation for their distinct records. After attending law school and spending some time in a private practice, Linda Sánchez chose to work for the International Brotherhood of Electrical Workers Local 441, the National Electrical Contractors Association, and the AFL-CIO before entering Congress. In contrast, Loretta Sanchez spent her precongressional years as a financial analyst. According to Carnes’s definition, Linda is categorized as a member of the working class (yes, even though she is a lawyer), while Loretta is classified as a member of the professional class. But determining Linda Sánchez’s class by her experience working alongside blue-collar workers fails to measure the significant opportunity Sánchez had to change occupations and thus (according to Carnes’s logic) join a new social class. Perhaps more importantly, it ignores the fact that some difference in pre-existing values may have led one sister to work with a union and the other to join the financial sector. This same set of distinct beliefs—rather than the diverging career tracks of the two women—would likely also account for the difference Carnes observes in the sisters’ voting records. Carnes points to the sisters as “typical of the distinctions between lawmakers from different classes,” despite the fact that labor lawyers are still lawyers and presumably make white-collar salaries. While I do not find all of Carnes’s methodological choices convincing, the book certainly advances the conversation about how we should explore the impact of decision-makers’ class on economic policy. They say always leave the audience wanting more, and my biggest complaint with the book is that the data set ends in 2008, leaving open the question of whether the two dominant political developments of our time—the emergence of the Obama coalition and the Tea Party—reinforce or undermine his arguments. Columnist Peter Beinart has speculated that Bill de Blasio’s primary victory in New York City signals the rise of a new New Left coalition that is more economically populist in nature, reflecting the diversity and the economic reality of the millennials. With the ongoing civil war in the Republican ranks, is there a class division among the lawmakers on both sides? Carnes’s central thesis—that the class of our legislators is the hidden force shaping economic policy-making and priorities—may sound like common sense, but he is right that it’s severely underresearched. The book hits on some of the historical reasons why we have been slow to examine it, which includes scholars’ focus on other personal characteristics such as race and gender—traits that are easier to measure than social class. But the bridge from analysis to prescription—finding a way to get more working-class people into elected office—is a little rickety. Electing more members of Congress from the working class almost certainly would improve the chances that our national economic debates would more closely reflect the realities and priorities of the citizenry as a whole. But in American history, the economic priorities of the working class have often taken a back seat. Those rare times when their agenda gets heard tend to reflect the success of social movements rather than the leadership of legislators. I would go a step further and suggest that some of the shift in priorities that Carnes endorses began to happen in early 2011, not because of leaders in Washington but because worker-led movements in Wisconsin, Ohio, and Maine emerged. Occupy Wall Street pushed issues like foreclosures, student and consumer debt, and job creation (or at least the end of austerity) back to the top of the agenda, and showed that rhetoric that elites tried to dismiss as class warfare sounded fairly commonsensical to most Americans across the political spectrum. Think tanks like the Center for American Progress, where I work, made a major push for a jobs agenda over an austerity agenda, and President Obama’s re-election campaign returned to some of these populist themes. As a result, we’ve heard the President repeat over and over throughout the country that our economy grows best from the middle out and that inequality is the challenge of our time. 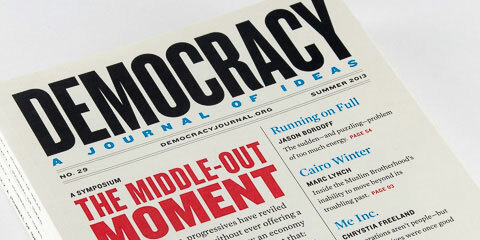 [See “The Middle-Out Moment,” Issue #29.] We’ve seen California establish a “millionaires’ tax,” SeaTac, Washington, pass a $15-an-hour minimum wage, and Bill de Blasio elected mayor of New York as an economic populist. None of this is to deny the important argument Carnes makes: that electing a few more representatives who remain rooted in the working class—from whatever party—could substantially change our economic policy debate. As he notes, America’s relationship to class is complicated, and tracking what is a powerful but often invisible identifier is a challenge. Carnes’s book offers scholars a much-needed jumping-off point for continued research on why the working class is vastly underrepresented in public office and how this impacts policy outcomes. Research will continue to be refined, but it is hard not to believe this is at least a component of the problem. When the House or Senate caucus is deciding whether to bring a bill to the floor, imagine if those members who so strongly identified with families making $250,000 a year during the 2010 tax-cut fight felt the same personal connection with the long-term unemployed or low-wage workers who haven’t seen a raise in years. Carnes’s effort reminds us that roll-call votes are cast by human beings, and their priorities may be shaped by the economic realities they faced before making it to Congress, and that their neighbors and former co-workers still face today. Tom Perriello is a former congressman from Virginia, and currently is a resident teaching fellow at the University of Chicago's Institute of Politics.